From left to right: William, Mitch, Logan, Megan, Emily, Zach, Tyler, Phoenix, Hue, Gabe, Alex, Daniel. Now that you know a bit about what Everend is, it’s time you meet the people of Strix Game Studios. 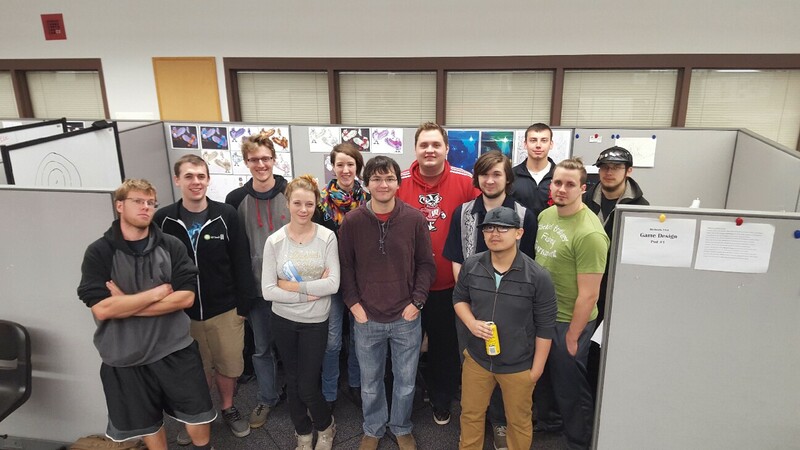 This team consists of 12 senior Game Design students from the University of Wisconsin Stout, with an even split between 3D artists and programmers. There may be other people contributing to other aspects of Everend, such as sound/music, but they will be credited and mentioned as they appear. So without further ado, here are the members of Strix Game Studios (in alphabetical order by last name). William Brereton is programming lead and will be working on enemy mechanics, any physics related tasks, and managing the programming team. Mitch Clayton is the design lead, on the art team and design, and will be working on gameplay design, environment art and managing the design team. Daniel Craig is a programmer that will be working on lighting, and any physics related tasks. Megan Daniels is an artist and on the design team. She will be working on narrative and PR for the game. Gabe Deyo is a programmer and will be working on the camera controls of the game and also be in charge of quality assurance. Emily Dillhunt is the art lead of the team will be working with textures, sculpting and shaders as needed for the game and she will also be managing the art team. Phoenix Hendricks is a programmer and on the design team. He will be working on sound to put in the game and putting sound in the game. Alex Knutson is an artist and on the design team. He will be working on level design and animation. Logan Larson is a programmer and on the design team. He will be working with shaders, the main character mechanics, and gameplay design. Zack Pasterski is an artist and on the design team. He will be working on level design and environment art. Hue Vang is an artist and on the design team. He will be working on animation, sculpting, and narrative. Tyler Walvort is a programmer and on the design team. He will be working with any environment physics and the main character mechanics. Each of the team member descriptions cannot hope to include everything that each team member will contribute to Everend, but at least now you have some idea of what each member has strengths in or has interest in. As a team we have attempted to let each member do something they are interested in or have more experience with. With that we are attempting to keep our team more content and also able to get experience with what they would prefer to work with. Together all 12 members of this team make a good combination of skillsets and by collaborating well, we can accomplish a lot. All 12 of us make up Strix Game Studios, and together we can make Everend to be the game that we want it to be through our hard work and dedication.